The countdown to London 2012 is gathering momentum ahead of the Olympic showcase in the British capital next year. But it is sometimes forgotten that this celebration of sporting ability at the elite level is actually two separate sets of events: following in the footsteps of the competitors parading at the opening ceremony on July 27th in Stratford will come the equivalent for participants in the Paralympics, on August 29. The latter will feature over 4,000 athletes with a disability who will be competing over 11 days and across 20 sports for one of those coveted gold medals. Given the media attention and crowds that the Paralympics draw in the new century, it is clear that no longer are people with a disability mere also-rans in terms of international sport; rather , they are recognised for the ability and competitive edge they possess. 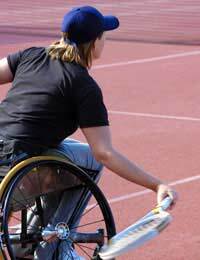 Unfortunately, it remains a fact that the number of non-disabled competitors – from enthusiastic amateurs to professional exponents – and the facilities they enjoy overshadow the equivalent for those with a disability. Slowly but surely, this picture is beginning to change around the world, thanks in large part to programmes such as the Yoodo Sports project that is the result of a joint initiative by Sport England, which has contributed £312,000 of funding drawn from the National Lottery, and the charity Leonard Cheshire Disability . Yoodo is aimed both at people with a disability eager to get a piece of the action as well as aspiring ‘buddies’ – individuals who are willing to give up their time to help others access activities. People can be both a participant and buddy for other members of the scheme. For those unsure about what buddying entails, the project’s home page incorporates downloadable fact sheets. Those interested in Yoodo have to follow a simple registration process before joining the online community where they can arrange meets and share ideas and experiences with others. Making contact online with strangers may fill some aspiring athletes with trepidation, so Yoodo has incorporated safety information for users regarding best practice when communicating through the web. The site also incorporates links to Yoodo’s Facebook page and an information film uploaded to YouTube. A glance at the site shows the diverse range of activities on offer, from gym classes and swimming to tennis coaching and sailing. The next step is probably the most difficult: motivation. It is at this stage where the good intentions of many fall by the wayside, mainly because they lack the confidence in themselves to get involved. This is where the buddy scheme comes into its own because not only does a companion help on a practical level in terms of accessing facilities but they also can provide encouragement and reassurance. Yoodoo Sports is being rolled out initially in the Yorkshire region of the UK, but with plans to extend the scheme nationwide during the Olympic year of 2012, it is hoped that the winners taking the plaudits of the crowd from the podium in the stadium won’t be the only ones able to sample the joy of sporting achievement during what promises to be an exciting 12 months. Is Professional Football Really Becoming More Dangerous?